A senior executive at Samsung Electronics said Wednesday that it plans to mass-produce chips to be used in various healthcare devices within the next three years. “Samsung is in the process of developing chips to be used in wearable devices. We aim to mass-produce such chips in the next two or three years,” said E.S. Jung, executive vice president of the firm’s semiconductor research center. He made the remarks in a keynote speech at the SEMICON Korea conference in the COEX Convention Center, southern Seoul.He said memory chips will play critical role in the Internet of Things (IoT) as every single product from leading manufacturers will be connected. Samsung Electronics has said that all its appliances will be connected by 2020. 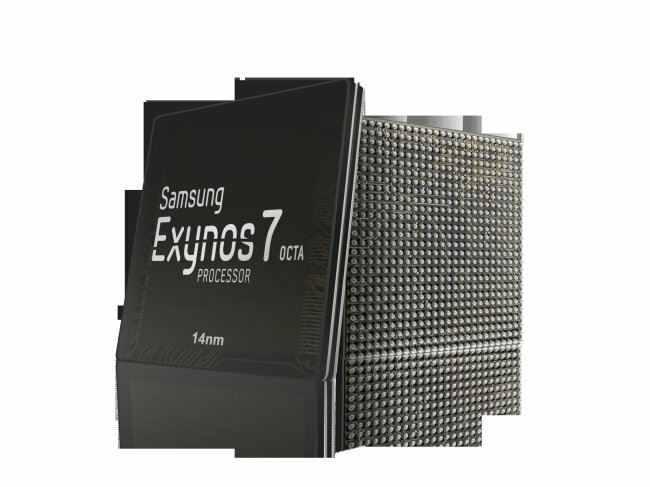 “Samsung is looking toward wearable memory chips,” Jung said. The company is betting on healthcare, and is collaborating with IBM, Microsoft and SAP to put their health platforms on Samsung devices. Jung said semiconductors are the basis of its healthcare products. Samsung Electronics, the world’s leading memory chip producer, plans to invest 13.5 trillion won ($12 billion) in semiconductor facilities next year, up from the 13 trillion won spent this year. “Samsung doesn’t expect a drastic change in the overall level of spending on chip facilities,” said a source Monday. He said the small increase in chips is because its strategy is all about maintaining market equilibrium and price stabilization. 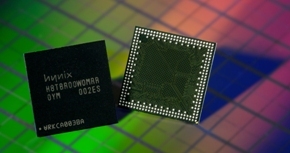 The global memory chip industry is being controlled by “top-three” players including Samsung, SK hynix and Micron Technologies of the United States. They produce more than 93 percent of global chips, according to research firms. 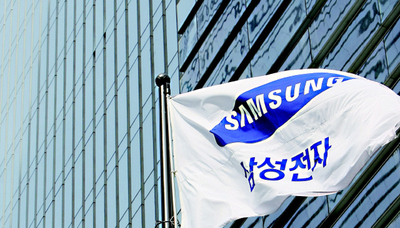 Samsung invested 12.6 trillion on chip plants in 2013, 13.85 trillion won in 2012 and 13.03 trillion won in 2011. Samsung plans to build a new NAND flash type memory chip line in Xian, China, where Samsung already operates its massive facilities. The semiconductor business is now Korea’s top export earner. Through November, the nation’s major semiconductor makers including Samsung and SK pulled in about $56.8 billion in revenues, the largest ever and about 10.9 percent of the nation’s total exports for the period. 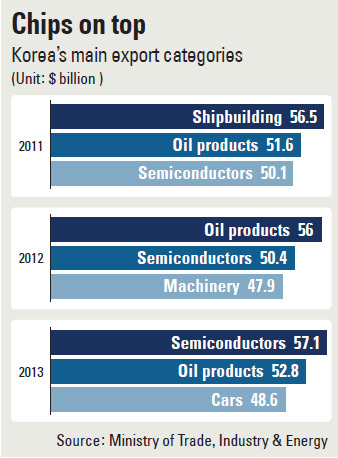 There are more than two weeks remaining in 2014, but since oil products are the second-largest export item with total sales of $48.1 billion through November, semiconductors will be the nation’s No.1 export business for the second consecutive year. Industry insiders say total exports for the business will exceed $60 billion by the end of the year. 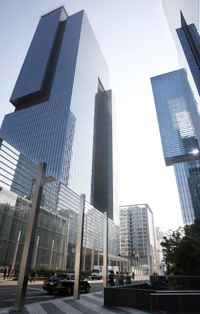 The semiconductor business, which began in the early 1980s, earned Korea foreign exchanges that were used as seed money to develop advanced electronics industries, including smartphones and wireless communication devices. It was the No. 1 export business for 16 years, from 1992 to 2007, but started fluctuating in 2008 due to the global finance crisis. In 2008, Korea only pulled in $32.8 billion, just 7.8 percent of the nation’s total exports, and chips ranked sixth in export earnings. Shipbuilding was the best export that year ($43.1 billion), followed by oil products, machinery, wireless communication devices, cars and semiconductors. S K Hynix announced yesterday it has started to mass produce an enhanced version of the world’s thinnest NAND flash memory chip. The company developed the 16-nanometer, 64GB multilevel cell NAND flash chip in the first half of the year. The new version, which is 10 percent thinner, went into production last month, the company said yesterday, adding that production of the initial version of the chip began in June. It is the first company in the world to mass produce the 16-nanometer 64G MLC NAND flash chip. Micron Semiconductor of the United States said it developed the chip in June. Samsung Electronics, the world’s top supplier of memory chips, plans to cut its investment in components by as much as 30 percent next year. The company doesn’t plan to build any more plants to make memory chips because the industry is undergoing rapid structural change. Industry officials at Samsung’s local primary parts suppliers say that aggressive investment does not guarantee high returns anymore due to industry consolidation as well as rising uncertainty surrounding technology and sluggish demand. Samsung Electronics Co. and SK hynix Co. — the world’s two largest computer memory chipmakers — said Wednesday that they have reached an agreement to share patents for chipmaking technologies, wrapping up three-year long negotiations. Details about the agreement, including the contract’s duration and royalty fees, were not revealed, but both of the companies reportedly agreed on a comprehensive cross-licensing deal. 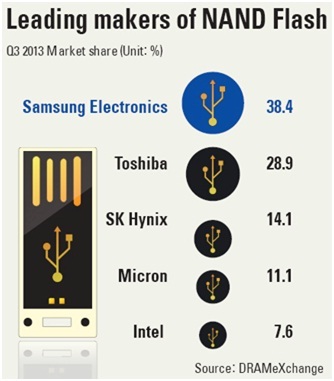 Samsung has 102,995 chipmaking patents, with the comparable figure for SK hynix being 21,422. Samsung also signed a similar deal with Micron Technology Inc. of the U.S. in 2010, while SK hynix forged a cross-licensing deal with Toshiba Corp. of Japan in 2007. South Korea’s electronics behemoth Samsung Electronics will create a 1.2 trillion won ($1.1 billion) corporate venture fund in Silicon Valley, the US in a bid to spur technology innovation and explore new growth engines. Samsung Electronics will make investment in diverse innovation-related projects by forming a Samsung Catalyst Fund worth $100 million, said Young Sohn, chief strategy officer of device solutions at Samsung Electronics during a press conference held at a hotel in California, the US Monday (local time). Under the new initiative, Samsung will seek M&A (merger & acquisitions) deals with global venture companies by using the existing $1 billion Samsung Ventures America Fund. Its target areas involve cloud computing, the internet of things, mobile security, mobile health and technology with emotional factors. Samsung expects the latest move will put itself in the position of creating new business ecosystem centering on semiconductors and electronic parts.